Home » Posts tagged "Involvement of Risk with Investment"
Required Rates of return is one of the key factors which influence an investment decision. Actually, Determinants of Required Rates of Return helps to calculate the required rates of return on an investment. Sometimes the required rates of return are considered as the cost of capital/expected rates of return which basically used as a discounting or compounding factor. By using this factor, we actually calculate the present and future value of cash flows. Here, determining factors are getting more important because this help to find out what should be our minimum required rates of return on investment. But the question is what are the determinants of required rates of return? Every economy may have inflation which is alright up to a considerable percent but exceeding inflation is not good for the economy. At the time of calculating expected rates of return, we must consider inflation. Higher the inflation, higher the required rates of return. It is a central bank and government responsibility to adopt an effective economic policy by which an accepted rate of inflation can be there for an economy. Investment selection process is influenced by the required rate of inflation. You know, there is nothing where risk is not involved. And it is money we talk about is more sensitive towards risk. Risk can vary from industry to industry, company to company, person to person. 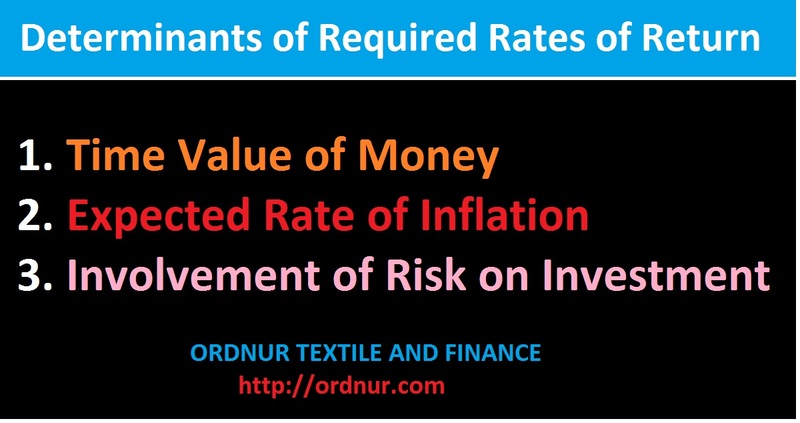 But the common thing is higher the risk higher the rates of return person expect from an investment. Although you may find there is a variation of risk-taking behavior among the individuals which is influenced by the personal trait of an individual. Risk can be broadly categorized into two head; one is systematic and other is an unsystematic risk. Systematic Risk: Directly involved with the system which arises from the macroeconomic factors and it is not possible to minimize this type of risk through diversification of investment. Unsystematic Risk: Unsystematic is a type of risk which is possible to minimize through diversification of investment. With this risk, there is a correlation between risk and diversification. The determination process is involved with complicated work because the process is depending on how market change over time and how investors behave with it. It does not necessarily need to be the same required rates of return for all the people. The rate will vary according to the economic factors and the personal risk-taking behavior of an individual. So it will be better for you if you identify the influencing factors and then calculate your required rates of return on investment.